Charlotte is going on her first solo tour - The Detour! Dates are now up on her tour page. In December 2018, Charlotte went down to Nashville to record 3 new songs at Sputnik Sound with producer Mitch Dane. The first of these songs, Shine, was released on February 20th - World Day of Social Justice. On March 3rd, Charlotte played a direct-to-vinyl live session with Brooklyn-based label Leesta Vall Sound. Only 5 additional records were made aside from the pre-orders. These 5 records will go on sale soon! Charlotte will be performing at a number of different New York venues in the first few months of 2019 including Rockwood Music Hall, The Delancey and Parkside Lounge - to name a few! Spent 2018 & early 2019 touring the USA with Peter Yarrow of Peter, Paul and Mary and The Lonesome Traveler Band, with a few select performances with Noel Paul Stookey (also of PPM) and George Grove (of The Kingston Trio). In February 2019, Charlotte appeared on two episodes of Alive with Clive. Read the article written about her music and watch the episodes here. ‘Call Me Baby’ off Charlotte’s debut EP was received as an “anthem for the Time’s Up generation” and was featured in various publications including MusicTo and Emerging Indie Bands. Played a live set on-air for a special New Year’s Eve broadcast on BlowUpRadio. Listen to Charlotte’s set here. Fan-funded the release of her debut EP ‘To New York, with love’, her debut music video for ‘City That Never Sleeps’ and her NYC solo concert debut at Feinstein’s/54 Below. Graduate of Northwestern University where she studied theatre, marketing and business. She also spent her 4 years composing for musical theatre for which she won The John and Marietta Paynter Award for the Creation of Music. Charlotte still has pursuits in theatre, often utilizing her actor-musicians skills with her many instruments (guitar, violin, ukulele, mandolin, melodica, piano). Charlotte Morris is a New York based singer-songwriter whose music showcases a unique blend of folk, pop and rock music. From her lilting folk ballads to her rock anthems for a new generation, Charlotte displays a wide aptitude for various styles. Charlotte draws inspiration from many of her favorite artists including Delta Rae, Brandi Carlile, Christina Perri and folk legends like Peter, Paul and Mary and Simon & Garfunkel. Her songs, which are mostly auto-biographical, also reflect her years in the theatre, with nuances and lyrical specificity akin to musical theatre writing. Described as “the love-child of Judy Collins, deftly playing her violin, guitar and our heartstrings”, Charlotte’s music and charming on-stage presence leave audience members wanting more. Charlotte released her debut EP 'To New York, with love’ in June 2018, which received recognition from newspapers and music blogs worldwide. Songs from the EP have been added to numerous Spotify playlists and ‘Call Me Baby’, the 2nd track, has now been featured on MusicTo for 9 consecutive months. 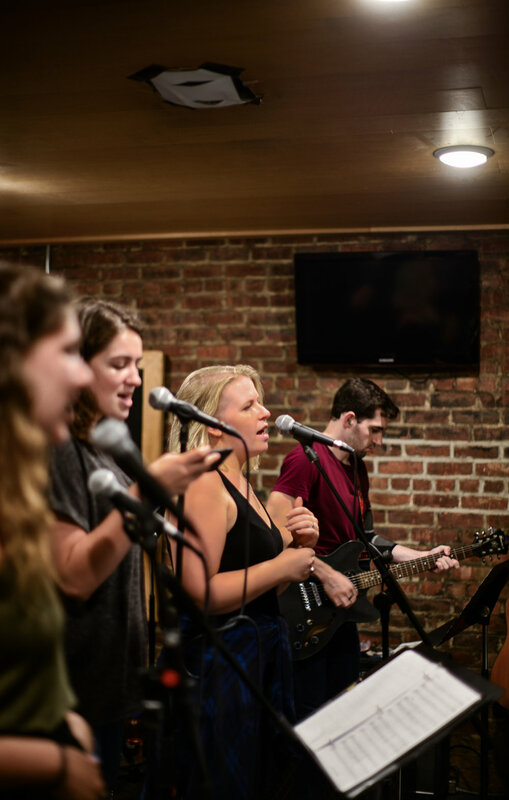 Charlotte plays shows in NYC frequently, with recent venues including Feinstein’s/54 Below, Rockwood Music Hall, Parkside Lounge and more. She released her latest single, Shine on February 20, 2019 - World Day of Social Justice. Charlotte is originally from outside of Philadelphia, and still spends quite a bit of time there, both performing and relaxing with family. When not writing and releasing music, Charlotte can be seen performing in theatrical productions across the country (coming up - Once at The Public Theatre of San Antonio), playing with dogs and eating cheese.